Survivor was not the first reality show, but when its debut season finale played to more than fifty million people, it launched an arms race between networks to green light as many new shows in the blooming genre as possible. It was like the Wild Wild West at first. No one really knew what the hell they were doing when it came to casting and putting together outlines, but over the past decade or so, the format has been streamlined to the point where an overwhelming majority of reality shows have hyper-specific codes of conduct that would be ludicrous in the real world. So, in honor of Utopia hitting the air twice this week, we though it would be fun to look at some of those rules and what specific game shows they’re tied to and talk about why they’re both so ridiculous and so necessary. 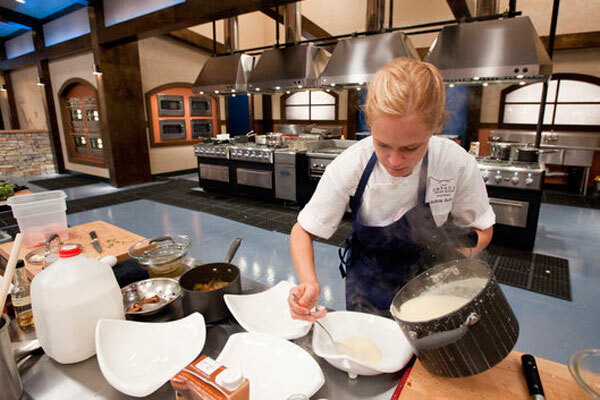 Contrary to popular belief, Top Chef is not about who can make the best food. It’s about who can make the best food, following a set of guidelines during a very strict amount of time. Sometimes the contestants are given hours. Sometimes they’re given thirty minutes. Regardless, the players are given the same amount of time and not one second over. As soon as the buzzer rings, no one is allowed to dish up anything, even if it means the contestant can’t serve his or her dish. On more than a few occasions, people have made incredible looking dishes, only to see them thrown in the garbage because they were half a second too late. Or more commonly, contestants are forced to serve their dish to the judges without sauce or a side dish. Brutal. It’s expensive to put on a show like Big Brother. You have to keep the house stocked with food. You have to design and pay for all of those wacky contests, and you have to film it all. As such, producers are not excited about any extraneous expenses, most specifically paying royalties to anyone who holds a copyright to a song one of the contestants sings more than a few bars of. This rule actually comes up a lot considering the contestants are taped at all times and people tend to absent-mindedly sing when they get bored. So, even if it means interrupting conversation with that loud booming voice over the intercom, producers can and will jump in to tell the singer to shut his or her mouth (“Please STOP Singing”) and go back to doing literally anything else, except taking their microphone off or using the toilet to strategize. How many people do you think go to the average high school reunion? I can guarantee the percentage isn’t as high as those who attend reality show reunions. Why? Because it’s actually written into their contracts. On The Real World, for example, contestants are paid $2500 to attend any reunion show organized, and they are given a minimum of two weeks notice. There is no option to not attend. That’s a straight up violation of the contract and could result in a lawsuit or a fine. Now and again, there are cast members who do miss reunion shows, but an overwhelming majority of the time, it is either because they a) weren’t invited because there was a serious falling out with producers or b) they had a gigantic life event like a death in the family or a late-term pregnancy. Most of us don’t go anywhere without our phones. Even if we’re not texting or actually making phone calls, we like having the phone there just in case someone else is trying to call us or we might want to reach out in the future. Not on reality shows. In fact, having a cell phone is the single quickest way to get kicked off, as one of the contestants on Utopia already found out when she was booted for her smart phone. When producers say they want you isolate, they want you isolated. Reality television works way better when everyone is in the moment. Phones take people out of the moment. Therefore, they have to go. When traveling in a foreign country, it’s always a good idea to take the most professional services possible. Anything that is government-sponsored or has been in existence for a long time is typically a safer bet than something that looks shady. When you’re traveling on your own, however, you do these things at your own risk. On The Amazing Race, that’s not always the case, though. In certain countries, there are shady taxi services contestants are not allowed to use under the threat of disqualification. The Amazing Race isn’t super open about the why behind this rule, but it’s pretty easy to guess. They don’t want any contestants getting their things stolen because while it makes for a fascinating one-off episode, it’s profoundly random and unfair.